We are looking for an enthusiastic individual with experience and an excellent track record in project management and partnership working, bid writing and a good knowledge of relevant activity and stakeholders in London. The person will join our team to offer project management to deliver the main project objective of supporting all schools in London to become food growing schools. Increased support is being shown for food growing in the community and in schools. The results of an annual survey of food initiatives supported by London Councils were published today by campaigning network London Food Link. The ‘Good Food For London’ report , supported by the Mayor of London and partner food and farming organisations , is now in its fifth year, measuring progress and encouraging local councils to take action on good food. Despite the improvements, London continues to have higher rates of obesity compared to the rest of England, in part reflecting the proliferation of unhealthy food offers on our high streets. With new food ventures opening daily, many of which do not serve or promote healthy food and often located in poorer areas, people find themselves faced with an unhealthy food environment. “Councils have great scope to influence the food served in their borough. While many are doing great work to improve school food, this is not the case the moment children step outside the school gates. We need more done to tackle the quality of high-street food”, explained Sofia Parente from London Food Link. The ‘Healthier Catering Commitment’ is a first step to help local authorities improve food in high-street takeaways, but despite its importance the report found sign-up to the scheme had slowed this year. The Good Food for London league table 2015 is topped by the London Boroughs of Greenwich, Islington and Tower Hamlets. In addition, four boroughs were recognised for having been consistently in the top five since results started to be compiled in a league table two years ago: Camden, Islington, Lewisham and Tower Hamlets. Eight boroughs were also celebrated for being ‘most improved’, demonstrating change is possible even in a short period of time: Barking & Dagenham, City of London, Croydon, Greenwich, Hackney, Newham, Wandsworth and Westminster. Tomorrow at 11:02am, British European Space Agency (ESA) astronaut Tim Peake will fly to the International Space Station (ISS) for his six-month Principia mission. Tim is launching on a Soyuz spacecraft from Baikonur, Kazakhstan which was rolled out onto the launch pad yesterday – watch here. Tim and the crew are due to rendezvous with the ISS at 5:23pm before climbing on-board to their new home at 7pm. You can watch Tim’s launch on a very special episode of Stargazing Live tomorrow at 10:30am on BBC One. There will then be a second evening Stargazing Live programme at 7pm on BBC Two showing Tim’s arrival on the ISS. Tim is an inspirational role model for young people across the UK and is dedicated to encouraging children to engage with STEM (science, technology, engineering and maths) subjects. It is because of this, we partnered with the UK Space Agency several months ago to launch Rocket Science, an exciting project allowing schools to grow seeds that have been to space. In September we sent 2kg of rocket seeds to the International Space Station and they will be stored there until March when they are due to come back to Earth with American astronaut Scott Kelly. When the seeds return, we will send them to up to 10,000 schools to grow alongside seeds that haven’t been to space in a huge nationwide science experiment. Read more about the project and sign up to take part here. We will be accepting applications until March when the seeds return to Earth. Tomorrow we will be exhibiting at the Science Museum in London and Edinburgh International Science Festival in Scotland along with a host of other organisations that are running educational projects to celebrate Tim’s mission. You can read more about these projects at the UK Space Agency’s brilliant Principia website here. If you’re on Twitter, keep in touch with us and involved in the launch by using #RocketScience and #Principia. 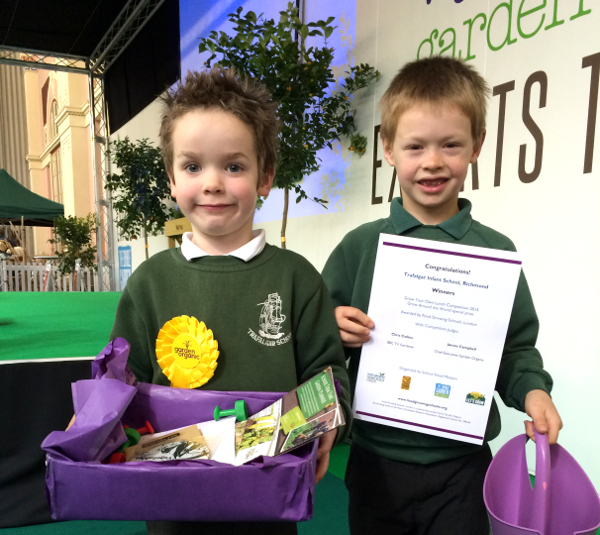 London students Theo and Indra were presented with their prizes for winning this year’s RHS Young Herb Photographer of the Year. Over the last couple of weeks we visited this year’s winners of RHS Young Herb Photographer of the Year to present them with their prizes. Winner of the 5 to 10 age category was Indra, 8 years old from 11th Newham West Scout Group in Stratford, London for his beautiful image of borage (Borago officinalis). The photograph, which was taken in the Peak District, was chosen by the judges for its exquisite detail, clarity and colour. Winner of the 11 to 17 age category was Theo, 11 years old from Thomas’s Clapham School, London for his stunning photograph of rosemary (Rosmarinus). The photo showed a sprig of rosemary in the sun and rain and judges loved the dramatic contrast of the soft raindrops against the dark background. Alana Tapsell from the RHS Campaign for School Gardening and Chris Moncrieff from Vitacress visited both Indra and Theo to present them with their prizes of an iPad Mini for themselves and £500 worth of horticultural materials for their school or group. You can see the photos from the presentations and the winning photographs below. To read more about the competition, click here. To see the winners, runners up and finalists, click here. Time to harvest your oca! In Spring 2015, as part of our Grow Around the World project 70 London schools joined our school’s experiment to see if oca could rival the potato on their school dinner tables! For those of your who were lucky enough to order your oca, we hope you have had fun growing them. You should now be thinking about harvesting your oca plants. The recent frosts may have caused the leaves of your oca plants to have wilted and died. Don’t panic as the frost was only short lived and should not have damaged the tubers in the ground but try to get them dug up in the next couple of weeks. Your plants may still be growing and the leaves will still look fresh. If you want to harvest the tubers now you could just ‘lift’ one plant to see how large the tubers have become. Don’t be disappointed by their size, if you remember when you planted them how small they were. Oca for your Christmas dinner! If your plants are still growing you may wish to leave the plants until December, as we mentioned in our November schools e-newsletter, and then you could add them to you school Christmas dinner as a ‘roast potato’ alternative! You can sign up to our free schools e-newsletter here. To harvest the oca tubers use a garden fork to lift up the whole plant similar to how you would harvest potatoes. Whatever the result please take some photos of your crop and PLEASE fill in the results form and send them back to us (Experiment Form). This gives Garden Organic very valuable information about how well oca’s grow in our climate, contributes to people science, and is great for student learning. Please send your completed oca growing experiment form, oca recipes, photos and drawings to us by Thursday 17th December 2015. If you would like to grow some oca again next year keep a few of your best tubers to plant in late March as you did this year. Keep as many tubers as you want plants or have space for. Using the best tubers you have harvested will ensure your crops improve year on year. Make sure the tubers you keep are dry, put them in a paper bag and store in a cool dry environment, NOT in your classroom as this will be too hot. An outdoor shed or unheated storeroom should be fine. E-newsletterspecial: Time to harvest your oca! (Nov 2015). School Food Matters are recruiting! School Food Matters is looking for an intern to research and identify new corporate funding opportunities for a range of food education programmes. This is a freelance contract funded by Santander and it provides an excellent opportunity to contribute to the growth and financial stability of a small but influential charity. The internship is paid and the successful applicant could work from home or at our office in SW14. The hours are flexible and the term of this contract is negotiable. It is important for applicants to have experience of the corporate world, an understanding of Corporate Social Responsibility and an interest in fundraising. Work on this project will begin in January. Please click here to find out more and to download the Job Description and application instructions, or forward this email to anyone you think might be interested. All applications must be received by 5pm on Friday 4 December with interviews taking place on Friday 11 December. Note: School Food Matters is committed to employing the best staff for a given post and ensuring that all staff are recruited on merit. We will endeavour to make new opportunities available to a wide variety of eligible candidates to promote diversity and equality of opportunity. Trees for Cities are recruiting! Trees for Cities is an independent charity that works with local people to transform urban spaces in cities across the UK and overseas. We work with local communities and partners to plant trees and green cities through urban woodland, neighbourhood tree, and edible playground projects. This is an exciting opportunity for a highly-motivated, confident individual to join our Development Team through our Edible Playgrounds programme. Reporting to the Development Director, you will be responsible for developing edible playground projects in schools in London and other UK cities; and for raising corporate income for our edible playground programme. The role involves working with schools, partners, businesses, and Trees for Cities delivery team. We seek someone with experience in corporate fundraising and experience of developing projects, together with strong organisational, inter-personal and communication skills. This is a full-time maternity cover position based in Kennington, London SE11. Trees for Cities is the only charity working on a global scale focussed on planting urban trees. We work in 25 cities across the UK and overseas to transform outdoor spaces through planting trees. We are a game-changing, ambitious organisation which sets the standard for urban tree planting. The sort of person we’re looking for. Visit the Trees for Cities website for information on how to apply, a for a full job description, application form and equal opportunities monitoring form: Trees for Cities. A huge thank you to all of you for supporting the campaign to save UIFSM! Today during Prime Minister’s Questions David Cameron announced that Universal Infant Free School Meals were safe. Talking about the policy, the PM said “I’m proud of what we’ve done and we’ll be keeping it”. You can watch it all happen here. The announcement was prompted by a question from Sharon Hodgson MP, Chair of the All Party Parliamentary Group on school food, who asked whether the PM would go down in history as “Dave the Dinner Snatcher”. Thankfully he will not and has honoured his manifesto promise … I suspect with a little nudge from all of you who signed our petition. Thank you! This is a fantastic opportunity to be involved in this inspiring, London-wide project. We are looking for an enthusiastic individual who has experience and a proven track record of working in communications & PR. We want someone with an excellent knowledge of a range of communications channels including PR, Media, Web and Social Media and with a good understanding of & press contacts within the London region. The person will join our team to offer maternity cover and deliver the communications strategy to facilitate the main project objective of supporting all schools in London to become food growing schools. For more information and to apply visit Garden Organic. Growathon – Ready. Set. Grow! The challenge is on. Growathon, a new initiative aiming to be the biggest London school food growing campaign of the coming year, has been launched by the Food Growing Schools: London partnership (FGSL). With the aim of reaching 10,000 London students growing food in our city by Summer 2016, students from every London borough are being set the challenge to grow one thing, feed their city, and tell a friend today! From classroom windowsill growers to urban school farms, and schools wishing to try growing food for the first time, every school in London is welcome to get involved. Activities such as workshops, lessons, assemblies, events, class projects and school farm visits will all be included. And schools will be able to advertise public growing events on the website to invite other young people to come along. Grassroots growing, educational and environmental organisations such as community gardens, are also being encouraged to support schools to meet the challenge, proving that together there is a real hunger for healthy, local food in our communities, starting with young people. “Since early 2014 Garden Organic has been proud to lead the Food Growing Schools: London partnership towards achieving the ambitious aim to see every school in London growing food. Growathon is a new initiative that recognises each and every one of our partner’s hard work and dedication to collectively reaching this goal, through their unique and inspiring school growing activities, events, resources and training”. FGSL partner activities include: Garden Organic’s Give it a Grow campaign, Capital Growth’s Harvestometer, the new Soil Association Food for Life Award Scheme, Morrisons’ Academy of Food, RHS Campaign for School Gardening workshops for teachers, School Food Matters’ Schools to Market (Whole Foods) and Young Marketeers (Borough Market) programmes and Trees for Cities’ Edible Playgrounds. The hugely popular Schools Marketplace is also back, on Thursday 15 October 2015 with the Mayor of London’s Food team opening the doors of the prestigious City Hall to the public one again. From strawberry jam to tomato ketchup, and the great British apple to winter salad bags – young entrepreneurs are bringing harvest time to the city. On the day participating schools will be entered in to the Schools Marketplace Competition, to win prizes awarded by Abel and Cole, the organic home delivery service and box scheme. Categories include: Best enterprising product, Best stall and People’s choice (by public vote). The Schools Marketplace takes place on Thursday 15th October 2015 from 12 – 3pm at City Hall, The Queen’s Walk London SE1 2AA. It is organised by Garden Organic and Capital Growth as part of Grow Your Own Business, a city-wide celebration of school food growing, enterprise and learning: www.foodgrowingschools.org/events/gyobusiness. To get a flavour of previous events visit: www.flickr.com/groups/foodgrowingschools/pool. A Growathon Forum event will take place in Spring 2016, for schools and growing organisations. This occasion will build on the success of Growathon so far, connecting with Food Growing Schools: London partnership organisations, and cementing relationships with food growing networks in London Boroughs to support schools locally. 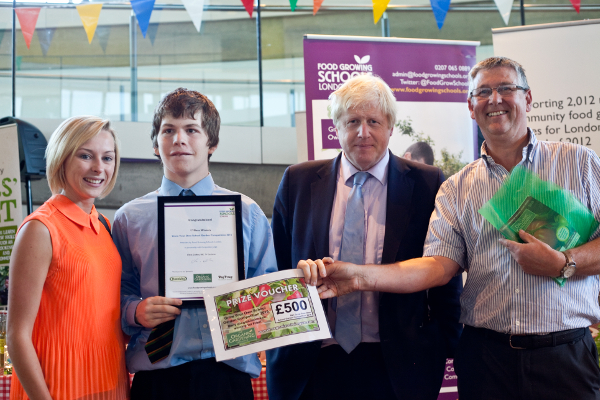 The Mayor of London, Boris Johnson MP, today confirmed details of a £42,000 funding pot that will allow schools in Lambeth and Croydon to grow their own food as part of his ongoing drive to tackle obesity in the capital and get young Londoners eating more healthily. Today’s announcement comes on World Food Day as Rosie Boycott, Chair of London, joins UN Secretary-General Ban Ki-moon and other influential leaders at the Milan Expo to discuss the challenge of sustainably eradicating hunger and poverty over the next 15 years. 10.8 per cent of London’s children are already dangerously obese when they start primary school and by age 11, one in five are obese. Poor diet is linked to further complications later in life, ranging from Type 2 diabetes to cancer whilst the cost to health budgets has been estimated at £5 billion a year currently and is rising. The School Garden Grants scheme will give state funded schools in both boroughs the chance to apply for grants ranging between £300 and £3,000 to create or improve edible gardens, which will be used to educate children about the food they eat and help them to lead healthier lives. Lambeth and Croydon were both selected by the Mayor to be Food Flagship Boroughs last year, working to tackle child obesity through better diets and food education. In a UK first, the boroughs are making changes to the way food is served in schools, hospitals, and – working with major supermarkets and other retailers – on the high street. The aim is to show that joined up thinking can improve health and academic attainment of pupils and also of adults in the local communities they serve. The Mayor has teamed up with Whole Kids Foundation to deliver the School Garden Grants scheme. Whole Kids Foundation – the charitable arm of Whole Foods Market – has run the scheme in the US and Canada for five years, with impressive results. Their work there has funded 3,014 school gardens, trained 8,438 teachers and served 3.796,922 students. By encouraging children to plant, nurture, harvest, cook and eat food they have grown themselves, the pilot scheme in London will help them to foster a love of good food and increase understanding of how diet impacts on health. The scheme will consider requests ranging from tools to training, equipment to part-funding a school gardener until the application process closes on 4 December 2015. As well as work in schools, the two Food Flagship Boroughs are demonstrating the transformational impact on health and attainment achievable through improving food across the whole environment. Rosie Boycott, Chair of London Food, said: “School Garden Grants are a great way to harness the enthusiasm of teachers, children and parents toward eating more fruit, vegetables and quality, affordable food. For more information go to www.london.gov.uk/priorities/health. Pupils at Rockmount Primary School in Croydon will have the opportunity to take their growing to the next level. The charity Trees for Cities has started work to create an Edible Playground which will be launched next Spring/Summer 2016. The edible playground will be designed specifically for the school, to include raised beds for growing fruit, vegetables and herbs and fruit trees will be planted along with climbing plants such as honeysuckle and blackberries. Pupils will enjoy planting and harvesting workshops throughout the year, and teachers will receive support to teach outdoors through gardening. The school has already appointed caterers with a focus on high quality, nutritious and freshly prepared meals and improved the aesthetics of the dining hall, introducing polka dot tablecloths, flowers and soft music and promoted the whole social experience of eating together. They then moved on to growing some of their own vegetables such as sprouts and chard on school grounds to contribute to school lunches Having been awarded Lead Food Flagship status an Edible Playground will really help the pupils and school to take their food growing to the next level. Through this project, growing and eating healthy foods will become an integral part of the school curriculum and the school experience. “As educators we have a huge responsibility to lead our children and support them to make the right choices to achieve healthy lifestyles” Said Helen Carval and Tracey Langridge, Head Teachers at Rockmount Primary School. “Through our engagement with Trees for Cities as a Lead Food Flagship project, we have been able to develop our food, crop growing and gardening initiatives. We are very conscious of the link between nutrition, health and academic performance. The project has been eagerly embraced and we are very excited about the wide range of learning opportunities this opens up for the whole school community”. Kate Sheldon, Acting Chief Executive of Trees for Cities said: “’With increasing concerns around food poverty, obesity and malnutrition, the next generation is in danger of losing touch with nature and not knowing why a healthy diet is important. Edible Playgrounds show children how rewarding it is to spend time outdoors and get them excited about where their food comes from”. TfC’s technical expertise in the delivery of Edible Playgrounds and operations is well established and highly regarded. The first Edible Playground was created in 2003. There are currently over 25 Edible Playgrounds in the UK with a further 50 to be rolled out over the next three years. This project has been supported by the Mayor of London Food Flagship Programme, Marsh and City Bridge Trust. The Mayor of London’s food advisor Rosie Boycott joined traders and local families at Brixton Market today to celebrate the launch of a brand new healthy eating initiative. The Rose Vouchers for Fruit & Veg project was set up by Alexandra Rose Charities in partnership with Food Matters with the aim of promoting healthy eating and combating food poverty by giving families vouchers that can be redeemed for fresh fruit and vegetables at local markets. The project will support 100 families with the provision of Rose Vouchers that can be redeemed at participating traders at Brixton Market and in West Norwood. Working in partnership with local children’s centres, the aim of the project is to work with families with young children who are living on low incomes. The children’s centres will identify families who could benefit most from the scheme as well as providing support such as cooking classes to build their skills and confidence. The project runs in partnership with Lambeth Council’s Food Flagship scheme; part of a wider initiative to make Lambeth’s food culture healthier and more sustainable. The Food Flagship project, funded by the Mayor of London and the Department of Education, aims to roll-out the good work happening around school food to the wider community. Lambeth will launch a range of initiatives to get residents eating healthier, more nutritious food over the next two years. Rosie Boycott, Chair of London Food, said: “The Mayor set up the London Food Board to help improve Londoners’ access to healthy, locally produced and affordable food. By supporting Lambeth as a Food Flagship borough, the Mayor hopes to foster a love of good, healthy and nutritious produce in children and families that will involve the whole community. Please click here to sign our petition and show your support for this policy! Huge thanks to all of you who signed the petition to save UIFSM! We’ve now got over 32,000 signatures and lots of press interest in the campaign. Please enjoy this BBC News piece featuring our friends at Lowther Primary School. We’ve had encouraging news this morning in the form of a Sky News piece reporting that David Cameron has pledged his support for UIFSM! We’re working hard to make this a reality but you can help by continuing to add your names to the petition and getting this news out to your network. Contributed by School Food Matters. Urban Food Awards 2015. Judges and Winners. Credit: Miles Willis. New Shoots Food Guru leads the way to a better future for young people. 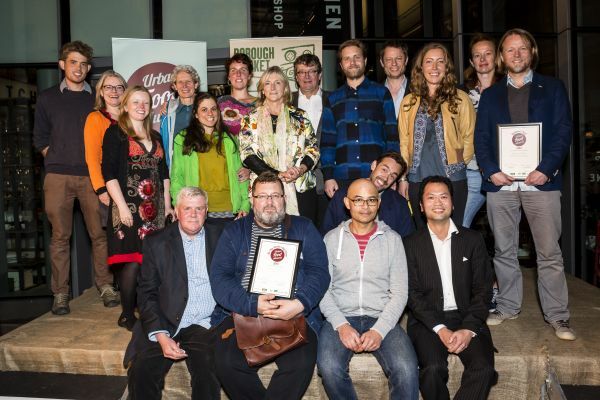 The victorious group of locally based producers and food heros were crowned top of their individual categories at an awards bash at London’s world famous Borough Market last night (Thursday 24 September). Four other producers were also recognised for their outstanding contributions to London’s food scene. Organised by City Hall and London Food Link in a bid to root out the best of the city’s local larder, the Urban Food Awards is a celebration of the very best food and drink produced by companies with 50 employees or fewer in the capital. Following nominations from Londoners, the winners were chosen by a judging panel, chaired by London Food Board chair Rosie Boycott, which included chefs Rowley Leigh and Ollie Rowe, while The Mayor of London, Boris Johnson, joined to help judge the cheese category. New Shoots Food Guru: A person showing passion and brilliance in passing on cooking or food growing skills to children and other young people. Food Hero: The cook, campaigner, retailer, whatever, who is leading the way towards better food for London. Capital Growth’s Growing Enterprise: A community food garden becoming more self-sufficient with a scheme that shows money can grow on trees. London Markets Initiative Krys Zasada Memorial Award: This year’s best activity to ensure one or more London markets will survive and thrive. The Urban Food Awards is funded by Seeds of Change and the Mayor of London and delivered by the Plunkett Foundation and London Food Link, with the aim of helping social enterprises and privately-owned business to become more sustainable, while encouraging Londoners to buy locally grown food. Download a full press release here. In September 2014 the government introduced UIFSM in schools in England. There have recently been a number of reports in the media that the government are considering scrapping UIFSM to save money. We are calling on the government to back UIFSM and not scrap it. In July 2013 the School Food Plan recommended to the coalition government that they introduce universal infant free school meals. Evidence from pilot projects showed that while all children benefit from free school meals, the low-income children benefit the most. Nutritional intake improved dramatically and, academically, children at these schools quickly moved ahead of their peers elsewhere by almost a term. That’s why we applauded the government for having the vision to provide infants with free meals. Having given schools over £175m to improve their kitchens, and encouraged the school workforce to make substantial changes to put it all in place, we believe the government is considering axing this ground-breaking policy. We need your help to ensure the government honours its manifesto pledge and keeps universal infant free school meals. Please click here to sign our petition and show your support for the policy. We need to protect this policy as it is not just children’s behaviour and attainment in school that benefits from UIFSM; health experts say it is a fundamental component of a wider child obesity strategy. It changes eating habits and improves children’s diet; packed lunches have on average three teaspoons more sugar than a school lunch and only 1% meet school food standards. It’s a fact that while 10% of children enter primary school obese, 20% leave obese, and diet-related illnesses cost the NHS £10 billion every year. David Cameron acknowledged this distressing trend in July and said preventative health was key to improving the health of the nation. Taking away UIFSM is going to make the task of tackling obesity a great deal harder. We also believe there is a strong economic case for keeping UIFSM. It stimulates the local economy with job creation in schools and catering companies, it saves parents £400 a year which can be spent elsewhere and brings wider benefits to the British food and farming supply chain. We need your help to ensure the government honours its manifesto pledge and keeps universal infant free school meals. Click here to sign our petition and add your name to the ever-growing list of voters who value this policy! Taken from the Soil Association Food for Life blog. Over the summer we have been busy refreshing our offer to schools to reflect that Ofsted now expects pupils “to be able to make informed choices about healthy eating” and will look for evidence of this both within and outside of the classroom. We have already been in touch with all our schools not funded by a local authority* to advise that from early October 2015, there will be a charge to be part of Food for Life. It may not be schools that have to meet this cost directly, there are a number of funding options available schools might like to consider, covered in our guide. Previously, Food for Life was able to offer our School Awards programme for free through grant funding (from the Big Lottery Fund) but now that funding has run out, it’s important we build on the success of our work and continue to support schools to establish a positive food culture. There are now two levels of access to the Schools Programme which are covered by our Food for Life ‘Membership’ package and our ‘Awards’ package. We have a host of new resources, training and webinars to support schools on their Food for Life journey. Every school achieving an award will also receive a site visit from one of our school food experts, giving schools valuable tips on how to demonstrate positive food culture to Ofsted and share their successes with parents and the wider community. Find out more about each package and possible funding options in our quick guide. Meet Ofsted core inspection requirements. Meet DfE statutory School Food Standards for good nutrition. Meet national cooking in the curriculum requirements. Receive support to give pupils a positive lunchtime experience. Use food growing, farm links and even school farmers markets to enhance the curriculum and foster enterprise skills. Due to these changes, for just a few weeks until early October, we are unable to accept new enrolments online. We are no longer awarding schools under our old programme but we will be in touch about how you can go about transferring your existing application over to the new scheme without losing any of your hard work collating criteria evidence. If you would like to register your interest so you are first to know once our new portal has been launched, please pick up the phone and speak to us on 0117 314 5180 or email ffl@foodforlife.org.uk. In the meantime, please take time to read our guide and consider which package is right for you. * Any school in a commissioned area, will be receiving direct communication from their Local Programme Manager to advise what these changes mean for them, if any. Sow it. Grow it. Sell it! The Mayor of London Boris Johnson buys produce from Trafalgar Infant School students at the Schools Marketplace at City Hall. Photo: Jane Baker/Garden Organic. With the expert guidance of the Food Growing Schools: London partnership, students can learn the secret to starting their own school food growing business, raising money for their school, developing employment skills and selling healthy, home-grown food to and with their local community. The highlight of the term sees the Mayor of London’s Food team opening the doors of the prestigious City Hall, for the Schools Marketplace, on Thursday 15th October 2015. Enterprising schools who plan for a bumper crop can apply to be one of only 15 schools to have a free marketplace stall! To get a flavour of previous events visit: www.flickr.com/groups/foodgrowingschools/pool. Schools that succeed in securing a stall at the Schools Marketplace will be entered into our Marketplace Competition, celebrating the most enterprising schools with prizes being given out on the day. The event is organised with project partner, Capital Growth. The deadline to apply is Monday 5 October 2015, and stalls are limited: www.foodgrowingschools.org/events. Why Grow Your Own Business? Grow Your Own Business offers schools the opportunity to learn about enterprise through growing and selling food, giving children the chance to learn new business and employment skills, across a range of subjects (e.g. maths, technology, PSHE). Enterprise activities can engage students of all ages and capabilities, even those children who aren’t interested in the garden or healthy eating. The Autumn term also sees the launch of the big London Growathon. Students all across the city will join 10,000 other young London growers for the biggest school food growing challenge of the year – to feed your city: grow one thing, and tell a friend today! Schools and growing organisations can share their food growing activities on the Growathon website, and watch the numbers of young people involved grow – on the Growathon Totaliser. Ready. Set. Grow! Beginning in October 2015. On Wednesday 02 September, 2kg of rocket seeds were successfully launched into space, bound for their new home aboard the International Space Station (ISS). Watch a video of the launch here. The seeds departed from Baikonur, Kazakhstan on Soyuz 44S – the flight that also delivered European Space Agency astronaut Andreas Mogensen and his crew to the ISS. The rocket and crew docked on Friday and the seeds were unloaded and placed safely on board. They will remain on the ISS for several months and return to Earth with astronaut Scott Kelly, currently planned for March 2016. The seeds have been send to the ISS as part of Rocket Science, launched by the RHS Campaign for School Gardening and the UK Space Agency. In case you haven’t yet signed up or heard of the project, we are giving up to 10,000 schools the chance to grow these seeds in 2016 and compare them with seeds that have remained on Earth. The project will enable young inquisitive minds to think more about how we could preserve human life on another planet in the future. Official applications for teaching resource packs (suitable for all ages) containing the seeds will open on Monday 14 September 2015 for schools that have pre-registered their interest. Applications will then open for remaining schools on Monday 21 September 2015 if remaining packs are available. You can still pre-register your interest on the RHS Campaign for School Gardening website up until Monday 14 September. Two teaser resources, a literacy exercise for primary aged pupils and a science activity on genetics for secondary students will be made available soon to download. Find out more and pre-register your interest in the project here. We look forward to embarking on this exciting adventure with you. If you have any questions or queries please contact us at schoolgardening@rhs.org.uk. Jamie Oliver, Sustain and Leon join forces to take action on sugary sweetened drinks and fund children’s food initiatives. Sustain and Jamie Oliver today launch a petition calling on Government to tax sugary drinks. The Children’s Health Fund is also launched by Jamie and Sustain, with funds coming from a self imposed sugary drinks levy by Jamie’s UK restaurants. Leon are the first group to join Jamie’s UK restaurants in adopting the levy contributing to the Children’s Health Fund. Doctors, dentists, dietitians and many other public health experts support a tax of just 7p per regular-sized can (20p per litre) of soft drink with added sugar. This could generate £1 billion per year which Jamie and Sustain believe should be ring-fenced to support much needed preventative work around childhood obesity and diet-related disease, and improving the environment they grow up in . Following the launch of his documentary Sugar Rush, Jamie and Sustain have also set up a Children’s Health Fund. The aim of the fund is to get restaurants and cafes to volunteer to put a 10p levy on their soft drinks with added sugar. The funds raised from the levy in participating restaurants will go to children’s health and food education initiatives. Jamie’s UK restaurants now all carry the levy, including his 41 strong group, Jamie’s Italian. Naturally fast food chain Leon, which began with a mission to bring good food to the high street, has already signed up, and other restaurants are in final discussions. Sugary drinks are often high in calories but of limited nutritional value, and many health experts are increasingly concerned about their contribution to weight gain and type-2 diabetes . Terrifyingly, one third of our kids now leave primary school overweight or obese. Tooth decay is the most common reason that children aged five to nine are admitted to hospital – 26,000 a year for multiple extractions under anaesthetic – and type-2 diabetes is costing the NHS around £9 billion a year . A green scheme launched by the Mayor of London Boris Johnson to create 100 new pocket parks in the capital has been so successful there are plans to roll it out across the country. The Mayor has today confirmed he has delivered his manifesto pledge to create 100 rejuvenated spaces as part of his pocket parks programme in 26 London boroughs. From a rain garden in Vauxhall to a dinosaur playground in Hornsey and edible gardens along a south London bus route, more than 25 hectares of community land across the capital have been converted into new enhanced green areas, thanks to £2million of funding from the Mayor. This was match-funded from the Boroughs, as well as grants from businesses and trusts. The programme to transform underused urban spaces across the city into mini oases for Londoners to enjoy has been a roaring success and proposals to develop it nationwide are being considered by the government. The Mayor of London, Boris Johnson, said: “From what started as a green shoot in 2012, dozens of glorious spaces have sprouted up across almost every corner of the capital, offering an oasis of calm from the hustle and bustle of city life. To celebrate the success of the programme, there is a free exhibition at City Hall, which runs to 28 August and shares the stories and experiences of 11 people who helped create pocket park projects across London. A small area in Churchward House, Lambeth, received funding to install planters to compliment a nearby area planted with street trees, which has dramatically changed an area previously just a walkway between houses. Jenny Jefferies, of Churchward House in Lambeth who helped on the project, said: “Gardens like these give everyone such a lift and make them feel good. I think there is a basic need to be among green things, people living in cities have fewer opportunities to be among plants, trees and flowers. Pocket parks are part of the Mayor’s wider plans to maintain London’s status as one of the greenest and leafiest cities. He has also delivered 20,000 Street Trees along London’s most congested roads and funds tree and woodland projects via the Community Grant Scheme, which is engaging communities and volunteers across London. The Mayor leads the RE:LEAF partnership of organisations and through this partnership has delivered a range of projects including planting 10,000 trees in Ealing last December. Marina O’Loughlin reports for the Guardian (Saturday 8 August 2015). Scroll down for section headed ‘Gayhurst community school, London E8’. The first thing that strikes me as I’m buzzed through the gates of the handsome, red-brick Gayhurst school in Hackney, east London, is the aroma. Walking past a splashily painted planter of herbs, I breathe in the fragrance of garlic and spices – very different from the damp cabbage reek I associate with school dinner halls. See full article in the Guardian (Saturday 8 August 2015). Almost a third (31%) of parents on lower incomes have skipped a meal so that their children could eat during the school holidays, according to a new report. ‘Isolation and Hunger: the impact of the school holidays on struggling families’, issued by Kellogs, revealed that more than six out of ten parents with household incomes of less than £25,000 aren’t always able to afford to buy food outside of term time. For parents with incomes of less than £15,000, that figure rose to a remarkable 73%, while 41% of parents in those low-income families had skipped meals during the holidays. School holidays are especially difficult for low-income families whose children usually receive free school meals or support from breakfast clubs. The All Party Parliamentary Group for School Food has produced a framework entitled Filling the Holiday Gap to support the provision of holiday meals. This is intended to support communities with a framework for providing good food as part of holiday learning, play and activity programmes. “We do not yet know the full scale of holiday hunger in the UK, but there are around 1.7million children who are eligible for free school meals who could go without that valuable daily meal this summer. Read original news story on the FFL website. Overall purpose: Food Growing Schools London is an exciting project which proposes to engage with all schools in the Greater London area in food growing. We will be working with local networks, educational providers, schools, volunteers and other stakeholders to provide a Pan London network of support for schools. We are looking for individuals who have a proven track record of engaging and inspiring schools, volunteers and communities to embrace food growing or similar activity. Download job description and apply via the Garden Organic website. Trafalgar Infant School in Richmond beat scores of green-fingered London schools to become special prize winners for the ‘Grow Your Own Lunch Competition’ organised by School Food Matters. Winning the special ‘Grow Around the World’ category awarded by the wider Food Growing Schools: London partnership, the students impressed judges with their sensational recipe design for an exotic, Tanzania inspired, two-course lunch. Trafalgar Infant School used their experience raising money for a school vegetable garden in Tanzania with the Tanzania Livingstone Trust, to inspire their recipes. “Our children were thrilled to win! They filled their growing beds with new produce such as okra, chickpeas, and coriander and then cooked up delicious recipes for all to try. They are looking forward to cooking their ‘Grow Around the World’ food again on their community Big Dig day for all to enjoy.” Rachel Hutchins, Sustainability Teacher, Trafalgar Infant School Richmond. Among the schools short-listed to win the special ‘Grow Around the World’ prize were Bensham Manor School, Chisenhale Primary School, Colville Primary School, John Ruskin Primary School, John Scurr Primary School, Sacred Heart Primary (Battersea), St John’s C of E Primary School (Kingston), St Teresa Catholic Primary School and Ursuline Prep school. “The quality of school competition entries was extremely high, with each new entry showing creativity and inspiration that kept the judges smiling. Exotic food is rarely grown in the UK, but London students showed a real thirst for learning, demonstrating that anything is possible.” said James Campbell (Chief Executive, Garden Organic). • A half day visit to the school from a gardener. • A Sowing New Seeds guide to growing unusual crops in the UK – plus a CD of recipes and posters, created by Garden Organic. • A watering can and bottle top waterers. 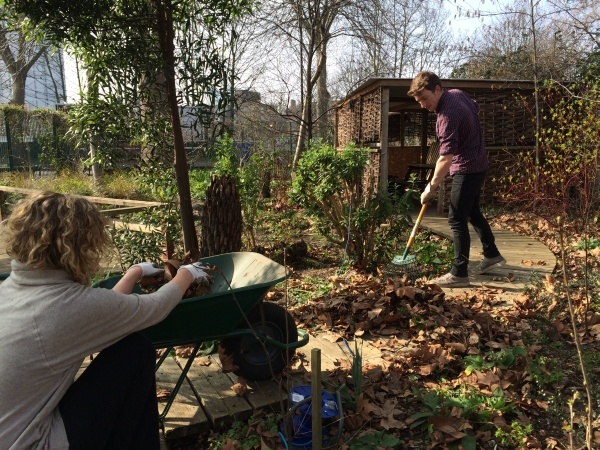 The Big Dig: Saturday 21st March 2015 – community garden national volunteer day. Press coverage: Richmond and Twickenham Times; Local Gardener. Businesses in London are joining forces with London schools for the Schools Big Dig 2015, a new two-week event matching corporate volunteering groups with schools who need help to set up or improve their school food growing space. This event is organised by Capital Growth as part of their wider Big Dig initiative, in partnership with Food Growing Schools London. Taking place between 16th and 29th March 2015, businesses including Civil Service Fast Stream, Edelman, Elba, Jamie Oliver Foundation, Nasdaq and Vodafone, will be rolling up their sleeves and picking up garden forks to help schools from Camden, Hammersmith and Fulham, Hackney, Lambeth, Southwark and Waltham Forest who have signed up. It will be a day to remember with activities including everything from preparing raised beds to digging over soil, making food growing structures and more – with plenty of fun and fresh air for all. Among the schools taking part is Archbishop Sumner Church of England Primary School in Lambeth, who will be welcoming Jamie Oliver Foundation staff to help develop their science eco garden. “We are very excited to be participating in the Schools Big Dig. The children are looking forward to planting their new fruit & vegetable crops.” said Babs Wright, School Cluster Manager, Archbishop Sumner Primary in Lambeth. Other London schools taking part include Grange Primary School (Southwark), Kenmont Primary School (Hammersmith and Fulham), Mulberry School for Girls (Tower Hamlets), Netley Primary School (Camden), St. Gabriel’s College (Lambeth), St. Scholastica’s Primary School (Hackney) and Willow Brook Primary School (Waltham Forest). Businesses and schools will be using the Twitter hashtag #schoolsbigdig to share their stories and photos of the day. Businesses and schools will be using the Twitter hashtag #schoolsbigdig to share their stories and photos of the day. Work has now started in the Food Flagship boroughs to implement and expand a range of projects aiming to improve the quality of food available to schools and communities; increase understanding of how diet impacts on health; develop practical cookery skills, increase food growing and foster a love of good food. Lambeth and Croydon were selected last Summer as the two Flagship boroughs after a competitive bidding process. The Flagship boroughs came out of the national School Food Plan published in July 2013. The plan included a commitment for the Department for Education (DfE) to support the Greater London Authority to launch two Flagship Food Boroughs in London. Using the School Food Plan as a critical foundation, the Flagships will demonstrate the transformational impact on health and attainment achievable through improving food across the whole environment, using schools as a catalyst to drive this change. The Food Flagships programme is now well underway in Lambeth and Croydon with flagship teams being set up in both boroughs to deliver projects with the vision to change the whole food environment. We will also be doing all we can to direct additional resource, expertise and enthusiasm towards the flagships to really start turning the dial. A good example of this is the connections we have made between the flagship boroughs and Food Growing School London who have recently started delivering training in Lambeth and looking to do the same in Croydon. The aim is to ensure as many schools as possible in the flagship boroughs will be food growing. Disclaimer: The Food Growing Schools: London partnership does not take responsibility for the content of news articles written by individual organisations, which are published on our ‘News’ pages.